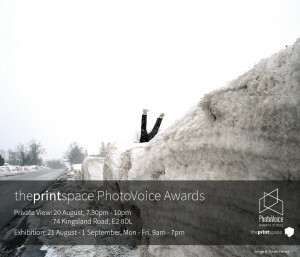 A selection of my photos from Transition Heathrow have been shortlisted for the Photovoice awards at Printspace in Shoreditch. On the theme of community, 5 other photographers have work featured showing diverse areas such as the reinvention of the Cornish in America today (Robert Herron) and Communes in Huerfano Valley (Zoe Childerley). 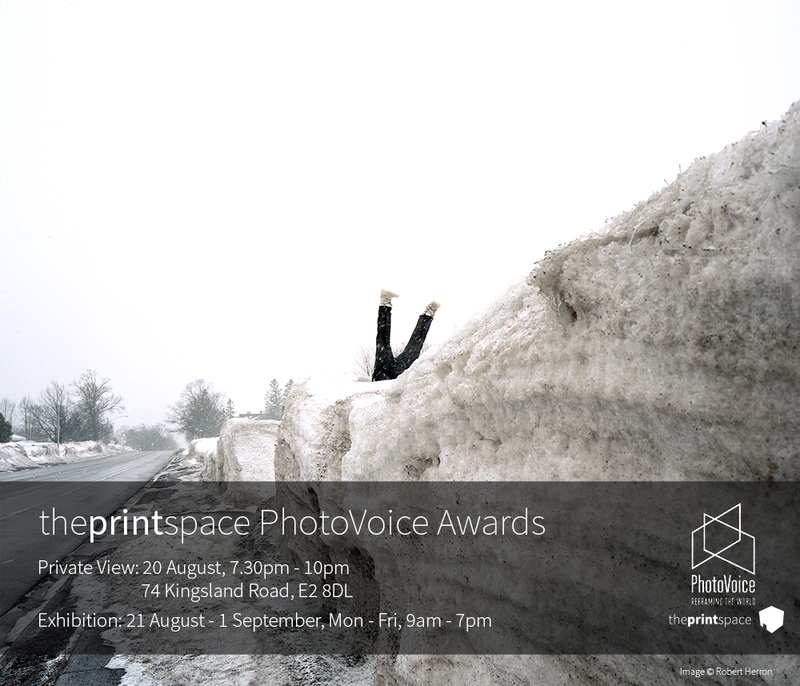 All welcome to the Private View 20 August. 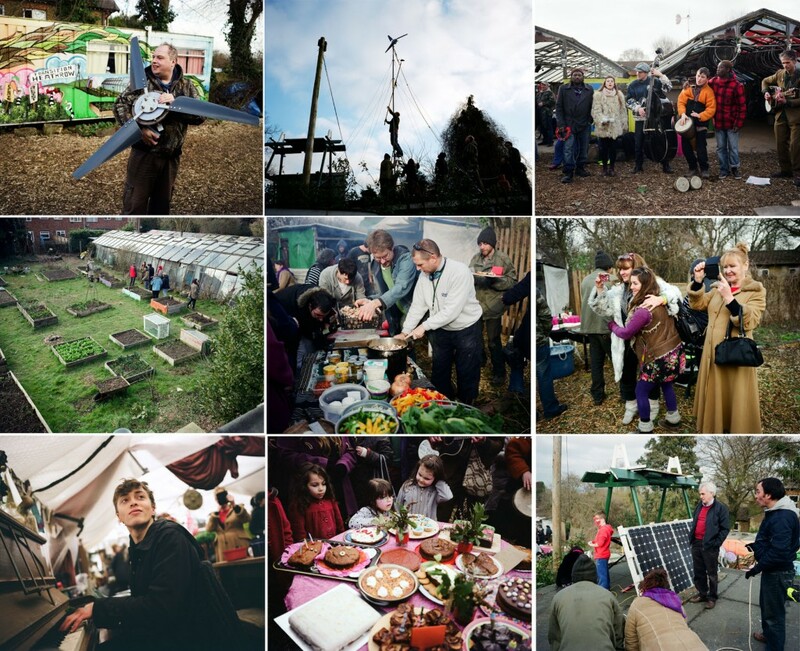 I have been photographing a community known as Grow Heathrow for over 3 years, a community garden and site for activists protesting against third runway expansion. Recently there has been a threat of eviction from a landowner who wants to regain control of the plot, despite leaving it as dumping ground previously. Local support in the area is unquestionably in favour of the residents of Grow Heathrow, who throughout over 4 years have created a community hub. The local County Court gave the landowner to permission to take his land back on the day of August 14th, but the show of support from residents and friends of the site was so strong, that Mr. Mallick didn’t have the means for eviction. There was also a massive media presence, with news of the day broadcast by the BBC and on The Guardian, Independent etc. Singing, dancing, speeches all took place, as well as gardening as usual, and meals served up made from vegetables grown on site or skipped. More Grow Heathrow images here taken over the course of 4 years. 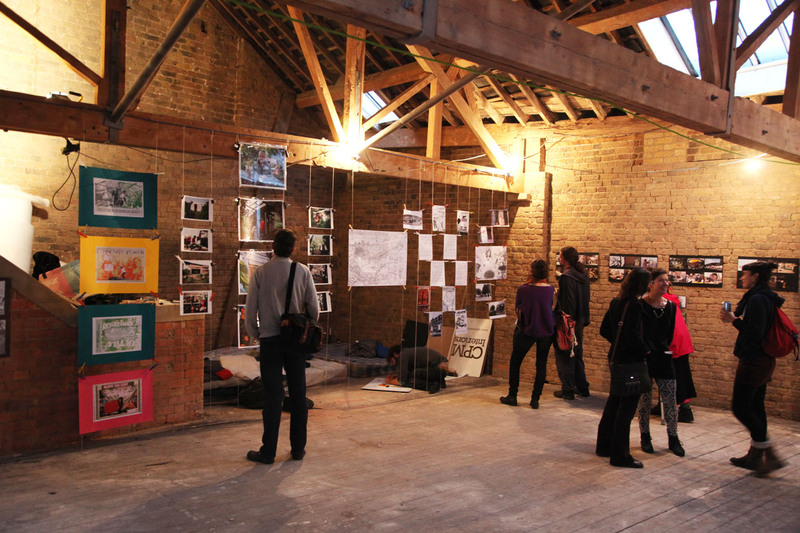 The emphasis of the exhibition is on the ways that squatting has shaped London, and the personal stories and experiences that arise when people decide to seek shelter, make a home or carry out a project in an otherwise empty or abandoned building. It’s been a year since the government made squatting in residential buildings a criminal offence, it may be that they will do the same with commercial buildings, which could bring about a big change. One of the other exhibitors is Alex Casper, who claims that “Squats are a place where art is made, found, destroyed. But squatting is itself a form of artistic activity, injecting life into landscapes which would otherwise be morbid and desolate”. The exhibition is on until Tuesday 16th September, details here. I have been taking photos at Grow Heathrow for 18 months now, and the recent open day celebrating the 3rd birthday of the project was the busiest I’ve seen it. Well over 100 people came through the gates, many of whom were people from the local villages, but also friends, squatters and people interested in alternative living from further afield, plus John McDonnell, the local MP. 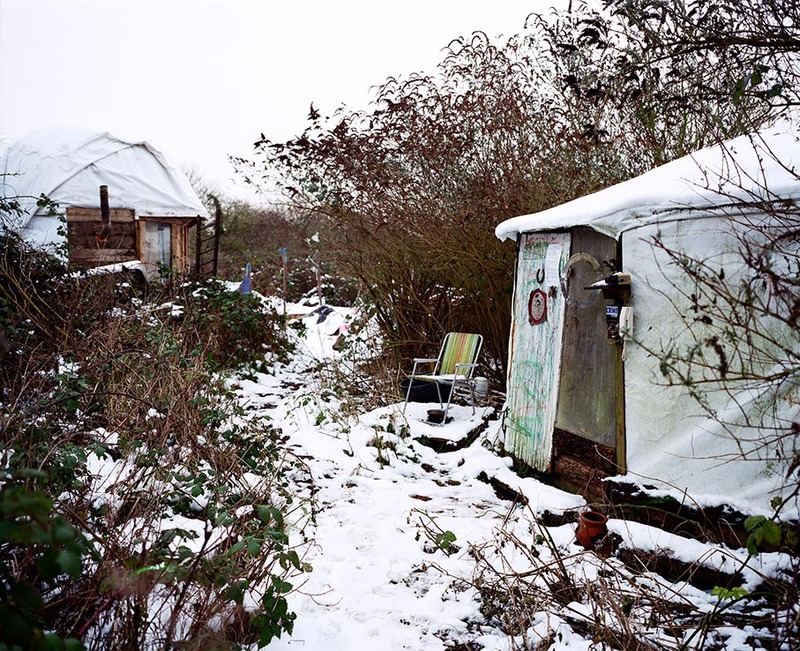 Grow Heathrow residents have for many months been threatened with eviction from the the landowner, and days like these are a good opportunity for strengthening ties for Grow Heathrow, which in turn reinforces the validity of the project. Highlights of the day included pizza assembly, music, site tours, erecting a wind turbine and yoga in the newly assembled yurt. The last one was the only place I warmed up on what became a chilly evening. More of my Grow Heathrow/Transition Heathrow pictures can be seen by clicking the link. 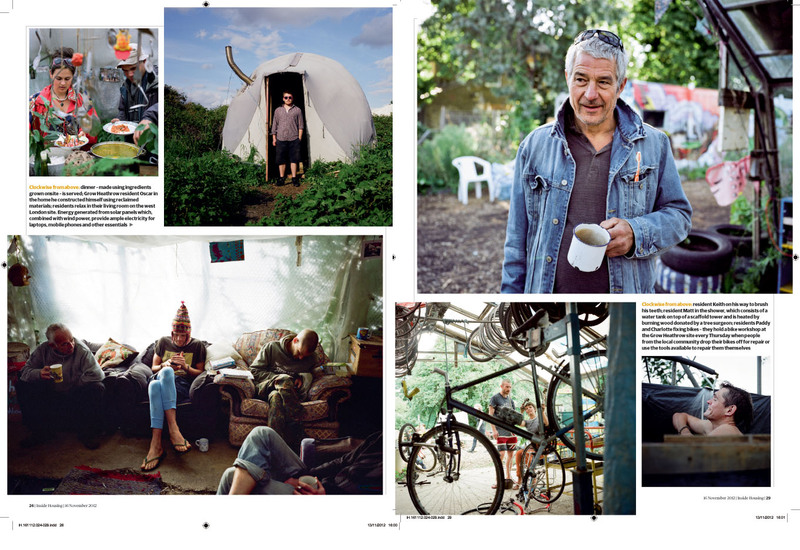 This is the second spread using some of the pictures I took at Grow Heathrow (see earlier post from Inside Housing). It’s the showcase magazine for members of London Independent Photographers, of which I have been a member for 6-7 years, and run the Shoreditch Satellite group meeting. I’m so used to seeing my “precious” photos cropped, that it’s great to see these images reproduced as they were taken, and also my text unedited printed on quality glossy paper! If you’re a photographer and not a member of LIP, do join as you’ll receive this magazine 3 times a year, amongst other benefits. 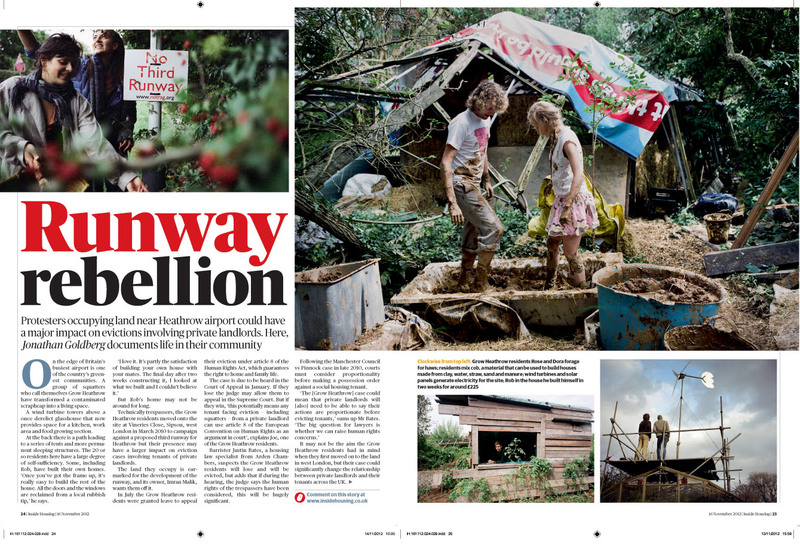 I am really chuffed that some of my images from my long term project documenting Grow Heathrow have been published across 4 pages in Inside Housing magazine. It’s rare that pictures are used so well, without cropping arbitrarily by editors and designers. Some of the copy is also mine, though adapted by the features editor Lydia Stockdale to make it more relevant to the readership. I’m happy that a magazine with such integrity has dedicated so much space to such an important story, thanks everyone involved. I’m planning on returning to the site and continuing with the project. Click here to view the rest of the project. 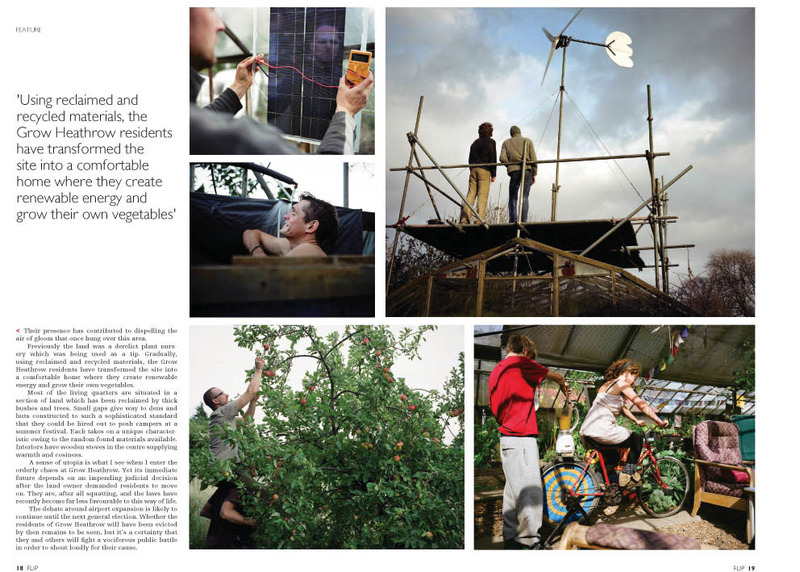 Photofusion exhibition of Grow Heathrow pictures. Thanks to Photofusion Gallery in Brixton for selecting 3 of my pictures for their Annual Members’ Photography Salon, which will open on 6th December. The pictures are all from the Grow Heathrow series, more about which is written below. They’ll be shown on a slide show. The two featured above both depict housing. The photo on the left is of two participants preparing cob, a material used for house building composed of local ingredients: clay, sand, hay, water and earth. It is fireproof, inexpensive and has been revived in recent years by the sustainability movement. Mixing the ingredients was a very interactive, not altogether clean experience. I like the photo because, for me, it contains an element of romance between the two participants. I have been trying to document the structures that residents at Grow Heathrow sleep in (top right). They are all unique and some very innovative due to the constraints that are placed upon them by using only renewable and found materials. This one is surrounded by tomato plants, and rather a lot of wild bushes, reminiscent to me of the Alaskan wilderness! Much of the weekend I spent at Grow Heathrow, an eco-village that is situated just outside the perimeter of Heathrow Airport. 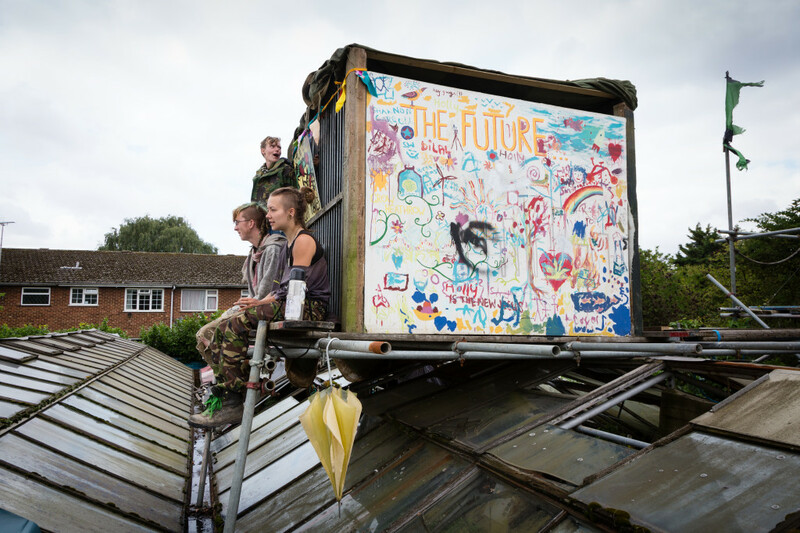 It started off as a protest against a third runway, and has evolved into a community that lives off grid, powering all of it’s own electricity through solar and wind power. 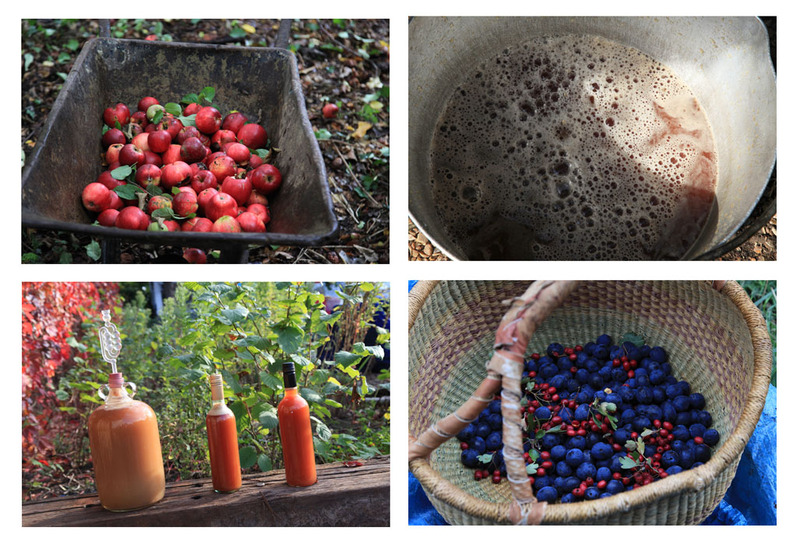 At certain times of the year they invite visitors to participate in events and workshops, like foraging and apple pressing which took place this weekend. I’ve been back to the site in order to photograph the evolution of the project every few week or months. Check out my ongoing project here. The apple press we used was an old fashioned one that made the whole process very interactive, and a great way to pass the time while chatting to others. The damsons (miniature purple plums) tasted really sweet, but the biggest surprise was discovering mushrooms on the way back from the orchard. Puffball and another unidentified variety were picked, and collected. The former are round, white and have little taste but do well in stews or with garlic.